If you recall at the end of the last article on Space I, I had a pretty big “WTF” moment. If you recall, I’ve stated that I use my own name in games, to add to the immersion, and the same is true here. Earlier I had named my character after myself, and after a long and fruitful career of exploring and trading, I got my character killed in the “First Blood” portion of the game. This involves some sort of Thunderdome-style combat, but doesn’t have spaceships, so I won’t be covering it here. It’s also not very good. The game tells you that, when your character dies, the data file is deleted. Therefore, when my character died, and I created a new one with the same name — MY name — for the purposes of this review, I THOUGHT I was creating a new character. Hell, that character DIED in a training accident for chrissakes. You can imagine my surprise, therefore, when embarking on a trading career after a mildly successful career in exploring, that I had nearly two million credits in my account and a scout ship waiting for me in the hangar. I thought my character DIED a while ago. I’m not sure if this was a bug in the game itself or the emulator, but it was confusing as heck. It did, however, save me the few moments of putting a down payment on the ship in the first place — which you have to do to gain access to it. The game lets you buy two different types of ship, small and large. I have the small ship, the Scout, which holds 10,000 units of cargo. The sad thing is that once you buy a ship, you’re stuck with it, as I saw no way to upgrade to the bigger model once I had enough money for a down payment. 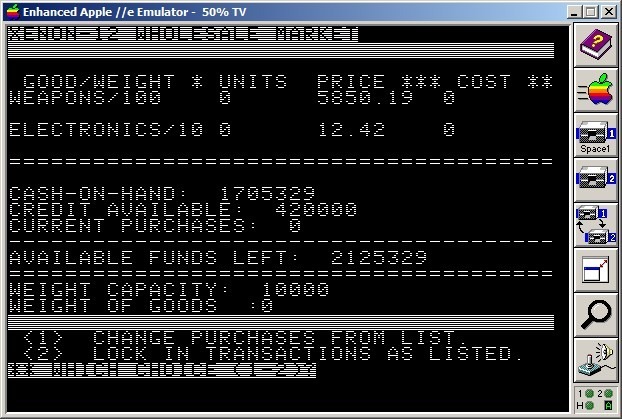 Anyway, I found my resurrected character on Xenon-12, waiting to buy stuff from the local wholesale market. Each planet has two goods to sell…that’s right, only two. In Xenon-12’s case, it was weapons and electronics. Now unlike other games, where stuff like weapons is contraband and if you get inspected by the police, you could get in trouble, Space I has no such law enforcement agency. Therefore, one can buy weapons willy-nilly, and that’s what I did, ninety units of weapons (at 100 spaces of cargo each) and 100 units of electronics (at ten spaces of cargo each) for a full load. After you lock in your purchase, you automatically take on a few passengers, then buy fuel to make sure you have enough to reach your destination, in this case, planet Y732A (again, those names are AWESOME, ain’t they? I wanna line on YB673GA street…). 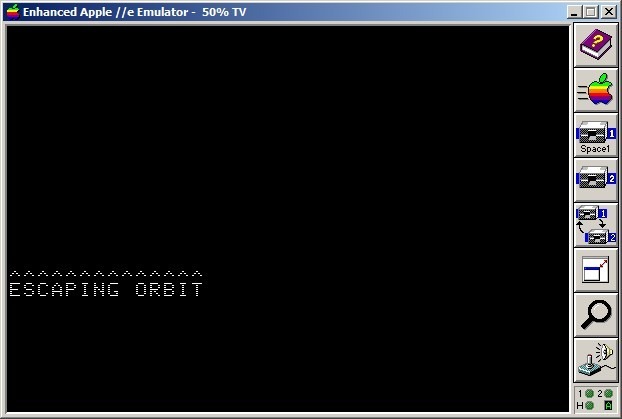 Leaving orbit shows some text that says “Leaving Orbit” as it slowly rises up the screen with the computer beeping at you, which is, again, charming. Choosing a destination is…well, there IS no choice. Your ship takes you there, and each trip always takes three months. This SEVERELY limits what little variety is already in the game. My trip was uneventful though, and I made about 254,000 credits/units/dollars/whatever the heck they call money in this game (i.e. they don’t, it’s just a number). Once a cargo run is done, you have the choice of paying off your loans (I didn’t have any), going on another trip, or ending the game. Wanting more money, I chose another trip. On the return trip to Xenon-12 (What, does this universe only have TWO planets in it? Or are those the only colonized planets around? The game doesn’t explain. ), I purchased 500 units of drugs (at two spaces of cargo each) and 180 units of crystals (at fifty spaces of cargo each). 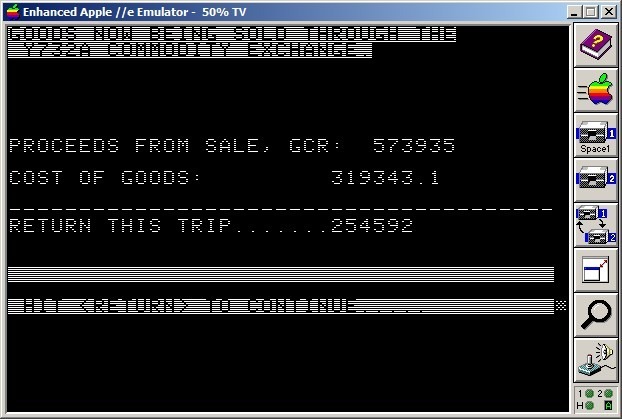 This trip was also uneventful, and I made around 14,000 money unit things that trip. 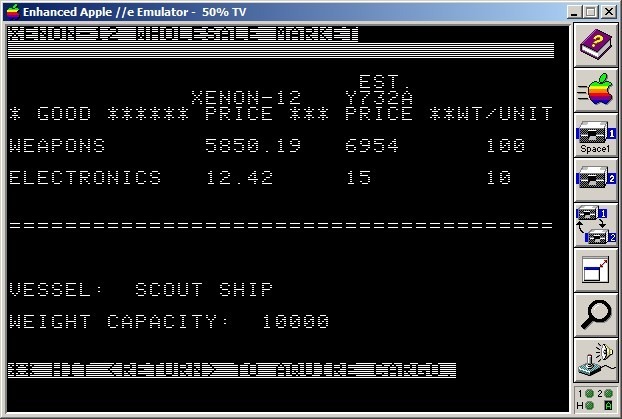 The next trip from Xenon-12 to Y732A brought in about 177,000 money unit things. I did this back and forth a few times until I tried something different…I didn’t purchase as much fuel as I was told I’d needed for the trip. FINALLY, something different happened YAY! 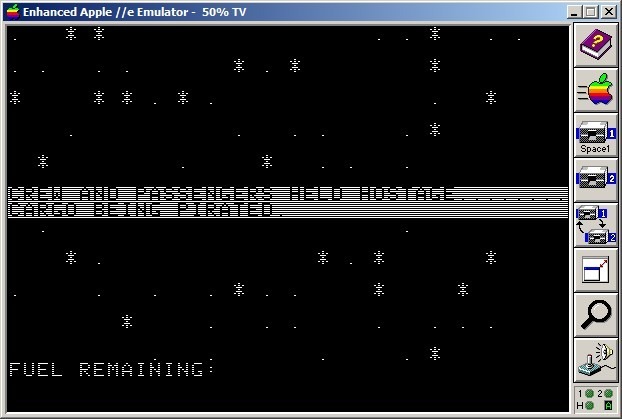 Our ship got pirated! The crew and passengers were all held hostage, and a bunch of my money as well as all of our cargo was stolen, but somehow I got a TON of fuel in the bargain (I guess I missed how this happened). I arrived at port with an empty ship and a smaller bank account, but none the worse for wear. After a few more runs, I decided to end the game. Space I tracks your character’s age as you play the game, apparently. When you first sign up for the armed forces in the school portion, you’re eighteen years old. I ended the game with my resurrected character at thirty six years old. In playing Space I, I found it was less of a space simulator and more of a choice simulator. The game kinda sorta took place in space, I guess, but it never felt so. While apparently this is based on the Traveller RPG — which I’ve never played — I felt more like I was playing a sci-fi Choose Your Own Adventure book. It was compelling for a little while, but overall, I ran out of motivation to play this game pretty dang quick. I honestly can’t recommend anyone play this one, as it runs out of steam pretty quickly and just leaves one wondering why they’re playing in the first place. Thanks for reading my little diary on Space I. You can go back to parts 1 and 2 to get caught up if you need to, and see all of the screenshots I took below. Stay tuned for coverage of the next game on my list, Super Star Trek! It's a shame this ended up so shallow as I really like the beginning of your adventure. Too bad you didn’t spend a little bit of time in the “High Finance” scenario… it ended up being my favorite part of the game. Basically a stock trading sim, but once you start making a bunch of money in the stock market – the credit potential goes through the roof. 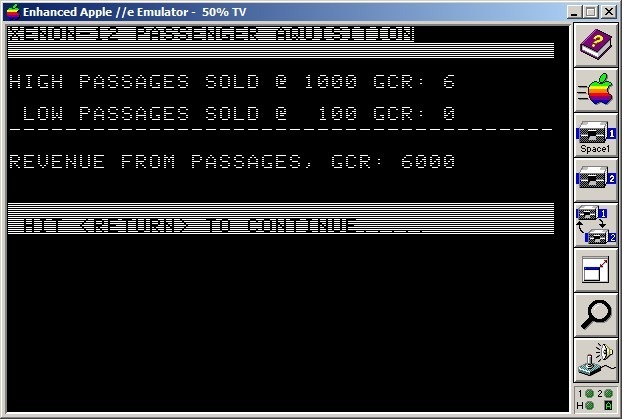 My character was 41 years old with over 2.6 x 10(12) million GCR. lol Eventually death finds you in the High Finance, and offers you a chance to continue with a lucky role of the device (but lose all your money anyway). Interesting stuff. Damn, that’s not only intense, but robust for such an early game. Impressive! Next story Starting in Space Games: Where to Begin? Previous story AI War 75% off over on Steam Today!